On April 8, the Omaha Cricket Club delivered cricket to the students of the Brownell-Talbot School. The Omaha cricketers could see that the children appreciated what they were doing, but yesterday, written evidence arrived by mail. 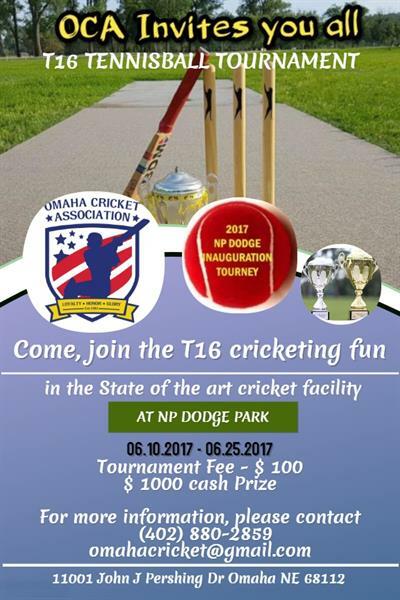 Omaha Cricket Association invites all the enthusiastic cricketers of the midwest to its prestigious 11th Annual Challengers Series T20 Tournament at the 'state of the art' NP Dodge Cricket Field at Omaha, NE to be held between Aug 11th - Aug 19, 2018.. The deadline for registrations is Aug 1st, 2018. OCA announces 2017 cricket season. Come lets play and have fun at NP Dodge Cricket Field, the pride of omaha cricket. Registrations are open now, first come first served. Registrations are now open and the deadline for enrollment is May 31, 2017. Click here to pay the registration fee. Defending Champions Stallions beat OCA Patriots by 28 runs to claim the 2018 11th Annual OCA Summer Blast Championship. Man of the match: Varun (FCC) for his match winning 3 wickets. Best Bowler: Dinesh (FCC) 7 wickets. MVP : Sandeep Raju - OCA Red devils - 8 wickets and 81 runs. Best Bowler - Ram prasad Cheruku (Rampi) with 9 wickets, and a game changing performance in Semi finals. Lunch was powered by Kurry Express on prelims weekends and also Semi-finals, Finals weekend. Several of our volunteers chipped in with great home made food which received admiration from KC and Lincoln. Here is what one of the KC folks said, "We should be ashamed that we do not provide such hospitality like OCA does, next time OCA visit to KC is on me"
OCA's 8th edition of Challenger Series 2013 was one of the peacefully done, non-controversial tournaments this year. Though the playoff weekend turned out to be humid and hot, but the passion and spirits were high with music, masti, family-filled environment. We had visitors honking from the streets to acknowledge our games. Visitors from BCBS, Sogeti, and UNMC witnessing to know the game, which made it even more interesting. This tournament could not have been done without the help of our volunteers. At a short notice, they chipped in with preparing great food, help us pack and unpack things, do some ground support. OCA couldn't have asked for more from their volunteers who are fortunately great members of OCA. OCA would like to extend our thanks to all the volunteers and organizing committee to help arrange such a wonderful tournament. We take pride in saying, its an honor and privilege to be part of such a family. We thank the families, kids, and support staff, and players who contributed in every way possible. Thanks to our sponsors Modis, Kurry Express, Namaste India, SmartStream Inc, Coca Cola.